When I was a little girl, I remember my small-town market dropping groceries off on our doorstep. While my mom only used this service a few times, I still have memories of the excitement about theservice. I’m sure my mom was happy to have the service when she needed it, too! When Publix came to the Outer Banks, I expected that they would have the online order and pickup option available since I had used it in another city. The grand opening came and went and the online program failed to launch. So, a month or so ago, I was excited to find out that the Harris Teeter in Kill Devil Hills had finally opened up their online ordering and I placed my order. I was pleased with the service, but since I would pass five other grocery stores just to get to this particular store, I didn’t make a habit of it. Now, I know what you’re thinking. Why does anyone actually need grocery pick-up? While I agree, this isn’t a service that everyone will see as necessary, but it certainly is an asset to some folks in our community. For me, it’s not something that I will take advantage of to replace my weekly grocery trip, but it certainly makes a mid-week restock a little bit easier, especially on a busy work day. I know that I would have paid the few extra dollars for the online ordering service when I had brand new babies at home, especially during the colder and windy Winter months. This service can also be of benefit to the oldest and youngest members of our community who can’t risk going into a busy store during the peak of cold and flu season. Likewise, if you were sick and needed to pick up some chicken soup and medicine, you can do so without entering a store and spreading your germs. Last week I was pretty excited to hear that a local Food Lion was beginning an online-ordering and grocery pickup service. I couldn’t wait to try it out, and although this grocery store isn’t the closest one to me, it is still convenient since my children’s after-school activities are nearby. I wanted to see how the service at Food Lion compared with the service at Harris Teeter so I put them both to the test on Monday! The first order that I placed was through Harris Teeter online. I ordered late at night and scheduled my pick up for the next day at 4 p.m. I received a phone call when my order was ready which was well before 4 p.m., but they keep it refrigerated until your arrival. Ordering online was easy. I was able to find products that I purchase regularly without any trouble. I ordered a bag of fresh green beans, a box of cereal, hand soap and some snack bars. I was surprised at the end of the ordering process that I didn’t need to pay for my order in advance. When I arrived at the Harris Teeter in Kill Devil Hills, I was honestly a little bit confused because the pick-up line blends in with the front of the building so well. I was expecting a parking spot in the lot, so it took me a few minutes to drive around before my oldest pointed out the drive through lane. Teenagers really do know everything! Everything went smoothly but took a little bit longer than I expected since I still had to pay. I had a very small order, and when you pull up for pick up, you call the telephone number on the sign. This prompts an employee to bring your order out. A few minutes later my order came out and was in two bags to keep some products separate. Since I still had to pay for my order, it added a few extra minutes to the process, but the employee was friendly and had a hand-held iPad that processed my debit payment. You can try out Harris Teeter’s online service by clicking here. At the same time that I placed an order for Harris Teeter, I placed one for Food Lion pickup. Since my goal was to compare the two stores, I wanted to place a similar order at both. 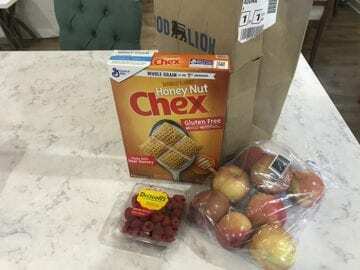 My Food Lion order included a box of cereal, a bag of apples and a carton of raspberries. When I placed my order on Food Lion’s website, I paid in full. I received a text message confirming my order, which was updated throughout the day to let me know that my order was ready. When I arrived at Food Lion, I parked my car and was able to make a quick phone call to tell them I had arrived. 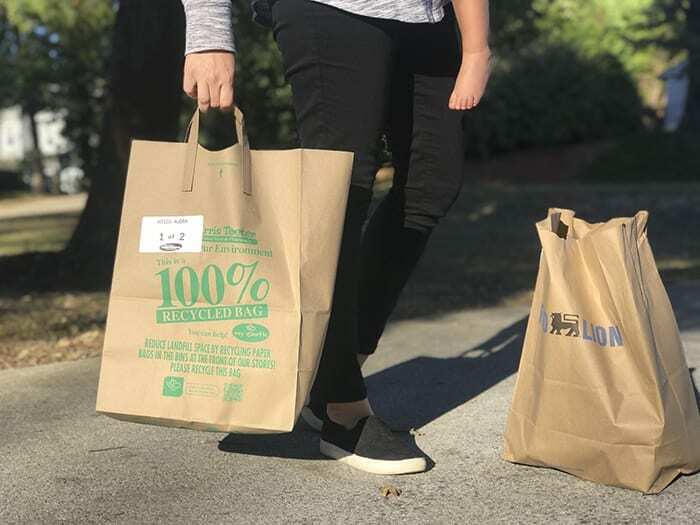 Food Lion has specific parking spaces for online pick up, so the transaction is smooth and easy Since you pay online, they drop the groceries to your car and you’re on your way in seconds. 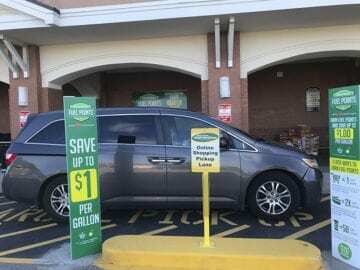 This option requires the employee to walk into the parking lot to get to you compared to at Harris Teeter, where they are still on the sidewalk. Since I had prepaid, Food Lion offered a faster service. You can try out Food Lion’s online service by clicking here and using the Instacart app. I made sure to order fresh produce from both stores because I wanted to make sure that I was getting the same quality of product that I would pick if I were in the store myself. I was really impressed with both the green beans from Harris Teeter and the fresh raspberries I ordered from Food Lion. The full bag of apples was perfect too. Now, down to price. Both stores charge a small fee, less than $5 to shop for you and deliver the groceries to your car. While the fee was waved this week to celebrate the launch of the program, I didn’t see it as a deal breaker. I know that I’d likely purchase a pack of gum or an impulse purchase if I were in the store and it would cost my about the same as the $5 fee. Finally, I just have to point out that online ordering is going to make getting groceries so much easier in the busy Summer months. I know that my local Food Lion goes from one lane open without a wait during the colder months to having all of the lines open during the Summer with a 20-minute wait. This mama really doesn’t have time for that with three kids in tow! I’ll be an online shopper this Summer for sure! I’m grateful that our local stores are keeping up with the trends and bringing this modern way to shop to our sandbar, which makes juggling tiny kiddos and grocery shopping a little bit easier. One small step for grocery stores, one giant leap for moms! Have you tried it out yet? Leave your own review in the comments! I’ve been on-line shopping at my home in Virginia for 8 years and am delighted to be able to take advantage of this huge time-saving service when we’re at the beach. So easy to order from home and pick up groceries on way to our beach home. Don’t want to waste any time shopping when we could be enjoying all that OBX has for fun and relaxation. With Harris Teeter you can pay online; you do not have to wait until you pick up you order to pay; they offer both options.